Quality Industries is a full service industrial organization with 85,000 square feet under roof located on a 12 acre site in Lake City in North-Central Florida. Through our five subsidiaries, which function as independent operating divisions, we are able to offer a broad range of on-site manufacturing and support services to the forestry, mining and general construction industries. We are specialists in fabrication, construction, manufacturing, industrial supply and steel supply. Our operations are supported by a well staffed engineering department and a professional sales and management team. We pride ourselves on staying on top of industrial trends and developments which is what keeps us a leader in equipment and technology. Design, fabrication and erection of entire sawmills and log processing systems. 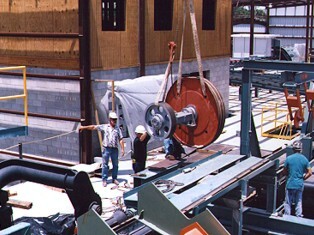 On-site installation of industrial machinery and equipment. Fabrication of equipment, structural steel and general industrial products including forming and rolling from steel and specialty metals. Design, manufacture and on-site erection of material handling systems for all industries. Design and manufacture of sprockets, hubs, chain attachments and general components for industrial use. Wholesale distribution of industrial tools, equipment and supplies. Supply, distribution and processing of steel and specialty metals. At Quality Industries we pride ourselves on the kind of versatility it takes to meet a broad range of needs. Our service begins with your first phone call which includes professional consultation in our areas of expertise. We'll follow that first phone call with a detailed work order customized to your requirements, a rigorous quality control program and our "Quality" professionalism from start to finish! At Quality Industries, Quality is more then our first name, it's our promise to you! Below is a brief synopsis of each of our divisions. You can click on any to the titles below or the links in the top menu bar throughout the web site go to that divisions home page. Quality Fabrication & Machine Works, Inc is a full service fabricator providing a wide range of products and services for American industry. We provide design and manufacturing of complete sawmills, log processing systems, high speed cut-up systems, log conveying systems, rotary kickers, cut-off saws, rotary disc screens and the Magnumï¿½ stair feeder. Quality Construction, Inc. specializes in complete installations including concrete, structural and mechanical erection, equipment setting, hydraulic, air and water piping, chute and hopper work. Quality Mill Service, Inc. is a warehousing distributor of conveyor chain, motors, reducers, associated hardware and much, much more! Quality Steel Supply, Inc. specializes in supplying steel to industry including first operation cutting and specialty processing. Our capacity includes oxy-fuel cutting of plate to 4" thickness, sawing of structural shapes to 24" plus plate shearing and rolling. Grizzly Manufacturing, Inc. is a full service machine shop featuring CNC turning and milling. We also produce and market our own brand of flame cut, heat treated sprockets and heat treated log chain. Click on any of the above links to go to the page with detailed information on that specific product or service!